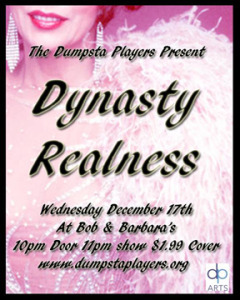 It’s an evening of massive shoulder pads and epic cat fights as the Dumpsta Players perform their tribute to 80s nighttime soap, “Dynasty”! In honor of friends who recently passed from cancer, including Charlotte Cardonick, Gloria Casarez and Dumpsta Players performer, Sarah Marshall, a portion of the proceeds from this performance will go to the Sara Weaver Fund. Sara succumbed to leukemia in 2002. 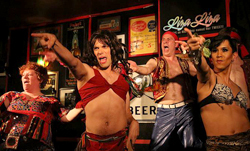 This entry was posted in Shows on November 21, 2014 by dumpsta.